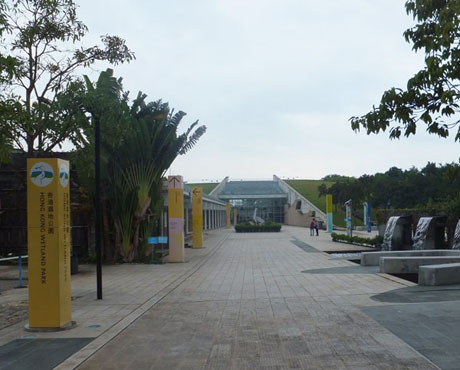 Opened in May 2006, Hong Kong Wetland Park covers a 61 hectare wetland reserve area on the outskirts of Tin Shui Wai in the north-west New Territories near the mainland border, It attracted over 3 million visitors during its first five years of operation. The park includes freshwater swamps, streams, mangroves, farmlands, fishponds, reedbeds, butterfly garden, floating boardwalk, three bird hides, crocodile enclosure and a large visitor centre. 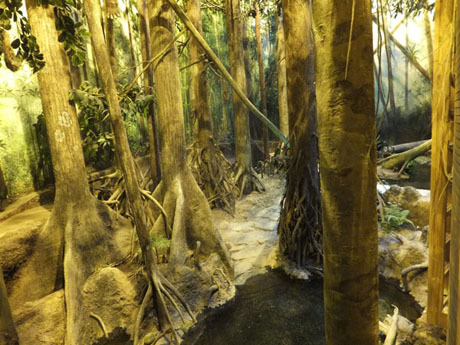 Visitors enter the park through the two-storey Visitor Centre which has a “Living Wetlands” exhibition with five galleries illustration the concept of wetlands, wetlands in the North Pole, tropical swamps, Hong Kong Wetlands the relationship between wetlands and human culture. There is also a “Wetland Challenge” zone with a series of interactive games and where visitors can be a reporter for “Wetland Television” and explore issues and make decisions on how to protect the earth’s natural resources. The Visitor Centre also has a theatre showing short movies about the wetlands and a resource centre. At the entrance to the outdoor Wetland Reserve is the landscaped crocodile habitat and pool which is home to “Pui Pui” a saltwater crocodile, believed to have been an illegal pet dumped having grown too big for her owner. 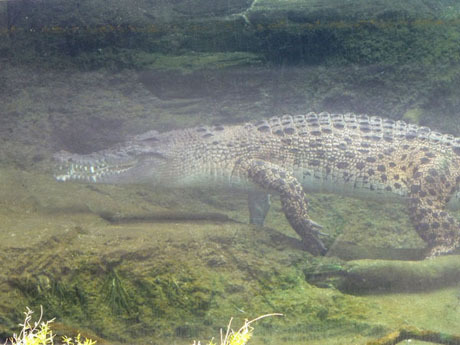 The crocodile was discovered in the Shan Pui River in the Northwest New Territories in November 2003 but evaded capture by crocodile hunters from Australia and China for seven months before falling into a trap laid by the Agriculture & Fisheries Department of the Hong Kong Government. 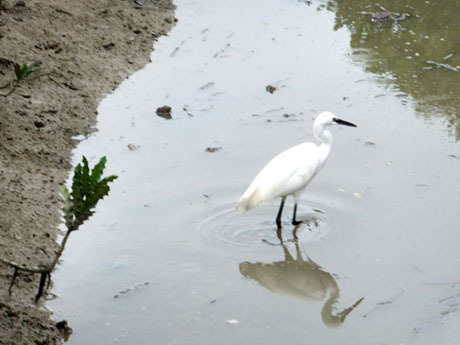 Pui Pui, which means "Precious One" in Chinese was temporarily kept at Kadoorie Farm and Botanic Garden for two years, before moving to her permanent home in the newly-opened Wetland Park in 2006. The Stream Walk passes a waterfall and pool with terrapins and otters and kingfishers can often be seen along the walk. 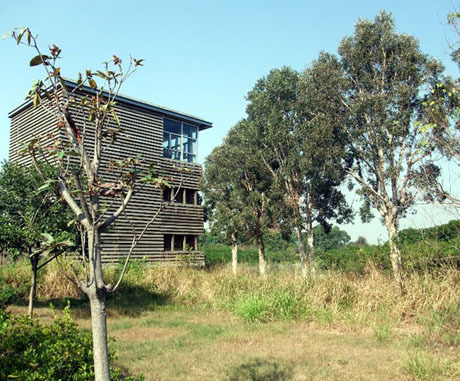 Also along the Stream Walk is the Wetland Discovery Centre which is an outdoor education centre with classrooms and laboratories where visitors can study stream and pond life and use interactive facilities to explore wetland wildlife. 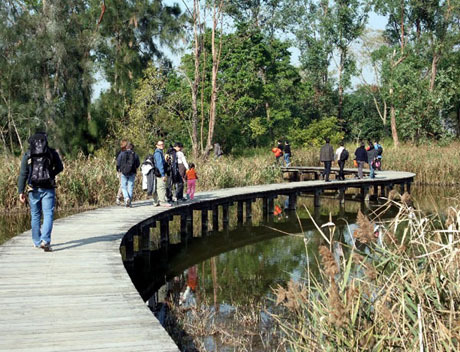 The Succession Walk takes visitors along a trail of aquatic plants via a boardwalk enabling an appreciation of the change of species as the habitat changes from open water with floating plants such as water lilies through to emergent plant such as reeds and finally to wet woodland. 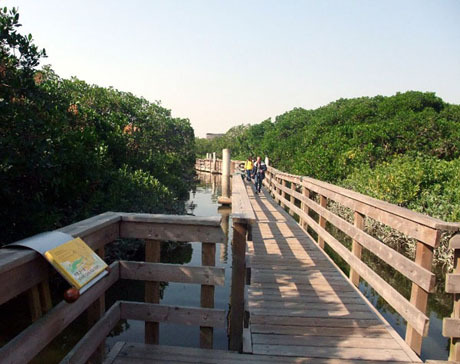 The floating Mangrove Boardwalk allows close-up views of the four species of mangroves and the tiny animals such as mudskippers and crabs that inhabit the mangrove. The Wildside Walk is a combination of boardwalk and paths alongside ponds, woodland and grassland where insects such as dragonflies and butterflies are commonplace and there is a Butterfly Garden with over 30 species of food and nectar plants attracting common butterfly species. 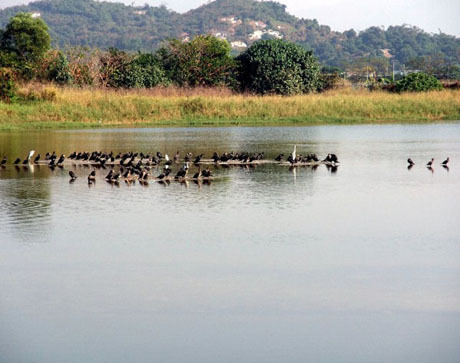 There are three bird hides, Mudflat Hide, Riverside Hide and Fishpond Hide along the route around the park, each equipped with telescopes which visitors can observe birds including Egrets, Kingfishers and Black-faced Spoonbills. The park also attracts a large variety of endangered birds such as Black-faced Spoonbills, Falcated Ducks, Baikal Teals and Eurasian Curlews attracted to its extensive area of freshwater marshes. 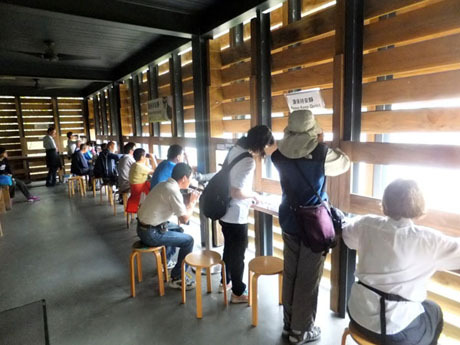 The best time for bird watching is when migratory birds arrive in the Wetland Park every winter. Beyond the ponds and marshes the modern high-rise buildings of Shenzhen just across the mainland China border are clearly visible. 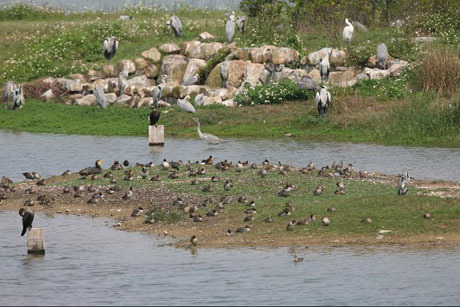 Every winter, Hong Kong Wetland Park attracts flocks of birds migrating from the north to inhabit in the wetlands. Two hundred and thirty eight species of birds have been recorded so far. The park has a large fast-food restaurant operated by Café de Coral in the Visitor Centre. OPENING HOURS – Sunday, Monday and Wednesday to Saturday 10am to 5pm*. 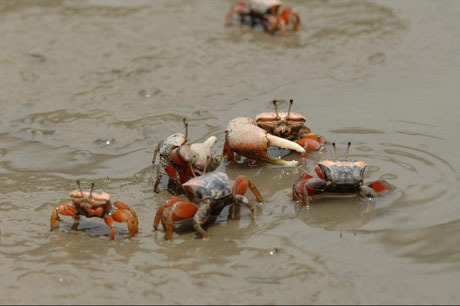 Closed on Tuesdays (except public holidays) and the first two days of Chinese New Year. *Ticket office open 9-30am to 4pm. ADMISSION – Adult HK$30, Child and seniors 65 and over, HK$15. Effective from 10th February 2012, persons with disabilities and their carers also qualify for half-price admission concession. 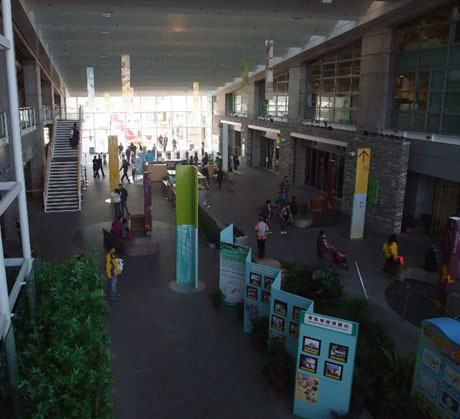 MTR - take MTR West Rail Line to Tin Shui Wai Station then transfer to Light Rail at Tin Shui Wai Station and take Tin Shui Wai circular service 705 or 706 to Wetland Park Light Rail Station. BUS - Citybus route 967 from Admiralty Bus Station (West) on Hong Kong Island every 20 minutes via Statue Square, Connaught Road Central and the Western Harbour Tunnel to Tin Yan Estate at Tin Shui Wai, stops outside the Wetland Park on Wetland Park Road (journey time from Admiralty about 50 mins).